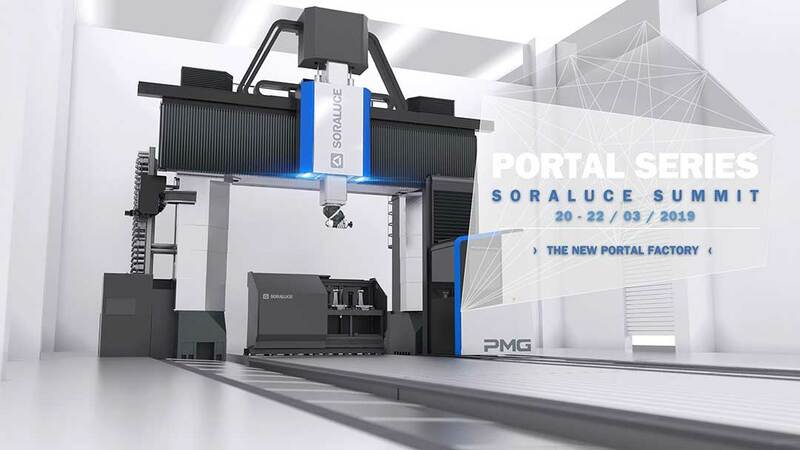 SORALUCE SUMMIT is the opportunity for the sector’s professionals to discover the latest SORALUCE technologies and developments and which will be held from 20 to 22 March at the new PORTAL FACTORY, the most comprehensive and advanced manufacturing centre for large-scale, high power portal machines. The new RANGE OF PORTAL MACHINES to be unveiled during the event consists of moving table milling machines, gantry milling machines, multitasking machines, ones with fixed and mobile beams, available with a full range of heads and options. They are part of the brand’s strategic commitment that has made SORALUCE a supplier of integral machining solutions. SORALUCE focuses on developing technological solutions for its customers that allow them to take efficiency and productivity to new limits. Realities such as “all-in-one multitasking” where milling, turning and grinding technologies come together in a single machine and set-up, meaning that set-up times become spindle running times, will also be centre-stage at an event that will bring together leading professionals to share experiences and expertise with the customers. The new PORTAL FACTORY, which is operating at full capacity, will be the scenario for the delegates to experience in real situations the smart technology capacities developed by SORALUCE, such as the DAS+ (Dynamics Active Stabiliser) and the DWS (Dynamic Workpiece Stabiliser). These technologies allow the machine capacities to be taken to unimaginable limits, increasing the stock removal rates, increasing productivity by up to 300% and the cutting capacity 100% by in the whole volume of the workpiece, and even making the operations more straightforward and intuitive. In this regard, the visitors will also be able to assess the advantages of the new Smart HMI interface with a universe of available applications and check with the VSET to what extent the workpiece alignment process can be shortened. Knowledge is the raw material of the future and SORALUCE SUMMIT 2019 |PORTAL SERIES is the place where it is going to be shared. During the event, SORALUCE will also showcase special integral projects specifically developed for some customers working closely on R&D&I and with the support of its research centre. SORALUCE seeks to create value for its customers and it is, therefore, constantly striving to exceed its expectations by designing and constructing new products, offering “best-in-class” services, be able to customise solutions and be technological leaders on the market. Furthermore, this vision must always help to improve the productivity and profitability of each of the customers. Therefore, SORALUCE SUMMIT 2019 | PORTAL SERIES is the ideal environment to share experiences and build the future together.